Inscription: American / Navy (two lines offset type. 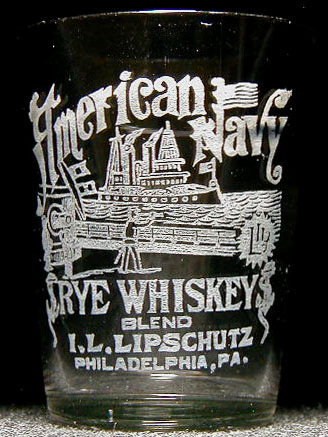 Text is elaborate with the Old Glory flying from the "N" of "Navy") / (elaborate picture: The spire of Philadelphia city hall is in the backgound, the deck of a battleship is in the foreground, and a tug or supply boat sails in between the two. On the deck in the foreground are two sailors standing next to a gun turret while an officer with cutlass looks out at the city through a telescope. A frosted seal with tsp ILL appears at right) / RYE WHISKEY (with snakes entwined around anchors to either side) / BLEND / I.L.LIPSCHUTZ / PHILADELPHIA,PA. Dimensions: 2-1/2" x 1-15/16" x 1-3/8"
Condition: There are a few fine scratches in the body of the glass from handling, but no significant damage - no chips, dings etc. The label is about perfect aside from a weakness on the word "Navy" that looks to be a labeling error rather than wear. Great display glass!